A while ago I wrote about general plans for the demolition and regeneration of three Woolwich estates. Detailed planning has now gone in for first stage of the regeneration of three Woolwich estates, under the ‘One Woolwich’ banner, which shows a few more detailed images. The Connaught estate, close to the new Tesco, will be demolished, as seen in the rather optimistic image shown above. This is part of a wider scheme which also sees the demolition of Morris Walk and Maryon Grove estates. More information can be found on a previous post by clicking here. 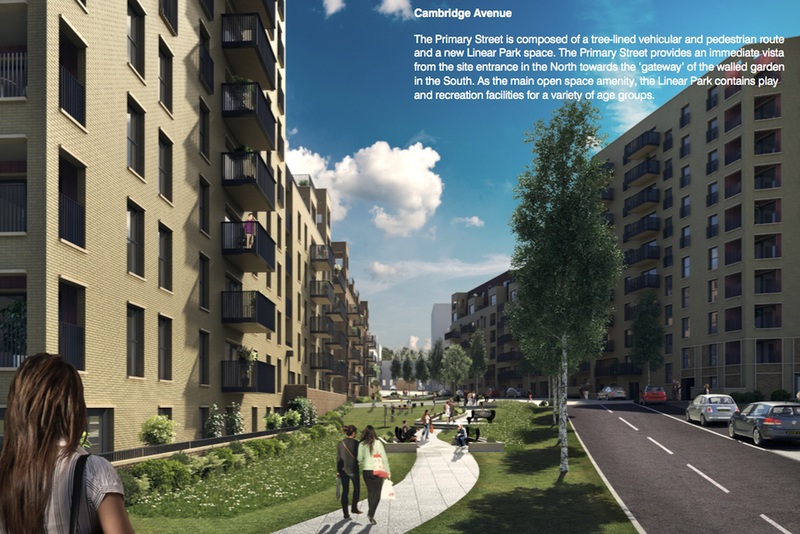 The new Connaught will include 654 homes, mainly in the form of flats. Yellow brick is the order of the day. This image shows the primary street running through the site. The landscaping is varied and maintenance will be crucial. Greenwich council are notoriously very poor at maintenance so that will need to be addressed. Though with just 35% classified as ‘affordable’ it could be that private maintenance will instead take place, coming from resident’s service charges. As for that 35% of affordable homes – 10% are shared ownership and 25% rent. With affordable rent now 80% of market rates they will hardly be affordable. in addition, it would be no surprise if the majority for private sale are sold off-plan, mainly to Asian investors, who then let them to people claiming housing benefits, due to the high rents. The tenants will now be renting from private foreign landlords instead of public authorities, with taxpayers picking up the additional costs via higher housing benefit costs. And the tenants get less security in year to year short term contracts. Such is the modern housing situation across Britain. More expensive for tenants, and more expensive for taxpayers. This shows a typical lack of care at street level. Look at the rails on the left, and the gate on the right. They are very cheap, unpainted steel. The wall on right below the walkway hasn’t been painted for years. This is typical, whether an area is due for demolition or not, and is symptomatic of the care shown to public spaces that needs to improve, to prevent new developments declining once built. The new Connaught will face onto a recent development which looks good, and which features a welcome splash of colour. The only problem with it seems that the steel fencing at street level is very harsh, and looks cheap as it is unpainted. It’s a shame that overlooking small details such as this can have detrimental affects on the whole development. The balconies also help relieve what could be a dull block. Good window proportions are also evident. A great step forward from developments throughout the ’90s into the 2000s, when Labour resisted any attempt for decent standards, e.g of window size, believing the market would deliver. They didn’t in the vast majority of cases. The image above shows a box with a non active frontage at the corner. I presume this is an electrical substation. It is a shame this could not be re-sited. This seems like an ideal place for a cafe and community space. It faces on to two patches of greenery, and would be a pleasant spot for eating, drinking and socialising. There doesn’t seem to be any retail or cafe/bar. No doubt the developers will say it’s a short walk to Woolwich, but this is a development where a couple of thousand will live, and a focal point is needed. 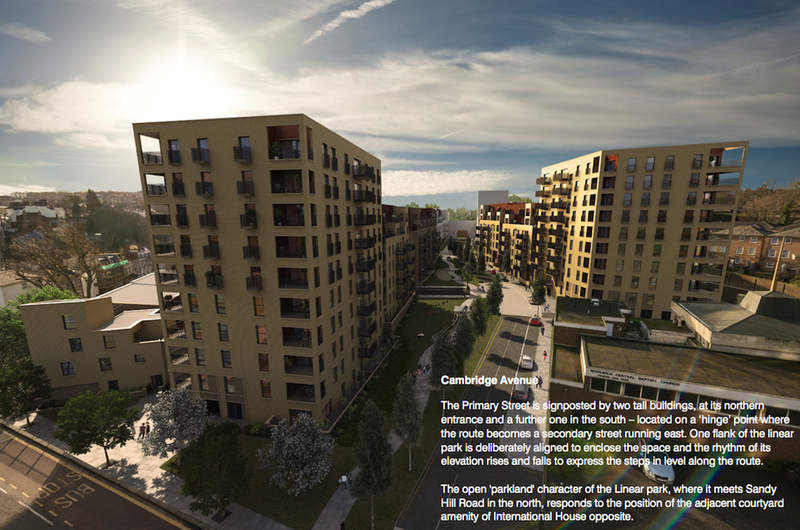 Finally, there is this render below showing the roofs of the buildings facing onto the primary street through the site. I’m a big fan of the mansard roof, with the odd brick balcony jutting out, along with the warmth of the roof colour. Links to all the documents relating to the application can be found by clicking here. 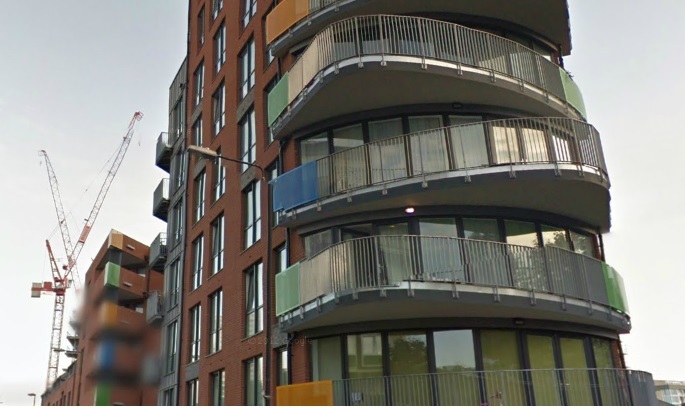 Slowly, the Borough of Greenwash is eradicating social housing – as well as industrial employment. Come the next local elections, why vote Tory when we already have a right-wing gentrifying council intent on removing the poor? So much landscaping and not a cycle lane in sight. I don’t think Woolwich is one of the great cycle centres of London. Any cycle lane would be a hopeless waste of space. I totally agree with Roy: the poor get hammered as the rich get richer. How can it make sense for a council to have to pay more in terms of benefits to top up private rent costs? Whatever happened to a councils obligation to provide plentiful, affordable housing to those who need it most? Does the councils plan include a cost benefit analysis (that is factually based)? Many parts of the “royal borough” of Greenwich would benefit massively from schemes like this – how exactly was it greenlit though? I thought the issue with redeveloping old, run down social housing sites was that typically they have (due to right to buy) a mix of private owner occupiers and social tenants? Much of the social housing is most certainly not run down and neglected. Several large estates have been substantially improved, in recent years – at Charlton Village, for example. Social housing is being diminished in two ways, the first in rather obvious regeneration schemes such as the Ferrier and, now, Morris Walk. The second in the ready capitulation on the Section 106 element of social and affordable housing on the Peninsular. Developers claim that they can no longer afford to comply with the original agreement and Greenwich, as usual, roll over. Just how many of the major housing developers are going bankrupt? Or have I missed something? Taking these two together adds to Larry’s significant point about spending priorities: sell off some of the estates and use the revenue to improve others. Furthermore, Greenwich are already selling off industrial land that they own – and buying more, apparently to sell to the same developers. This is the offshore company, LXB, that is developing the new Sainsburys site. If Greenwich proceed with their lunatic plan for Charlton Riverside, the destruction of employment and of critical goods and services (including a significant contributor to the defence and aerospace industries), will any of the revenue be used for new social housing in that area? I think that we know the answer to that! Money talks and councils listen. Big money shouts and rules and regulations suddenly relax. I have lived in or near Woolwich since the age of 4 (now 51) and seen the steady deterioration of the town. Its not just about the housing – its about the public spaces, the leisure facilities and the (heaven forgive me) shopping. In my opinion the council should have capitalised on the towns historic heritage. I would have preferred to see, much like Rochester High St, a reverence to old buildings, which Woolwich has if you only look above the garish shop facades. It has always been a market town but the present market is a joke, unless you need a phone cover, rug or watch. I won’t even mention the Indoor Market. Why not reinvigorate the market and draw people in from the surroundings. You only have to look at how popular Greenwich market is to see what a successful market is like. The waterfront leisure centre is tired at best, the Millennium Park by the river is a sad neglected place that cries out for a riverside cafe. I laughed when people told me how the Royal Arsenal development would “regenerate” Woolwich. Have you seen how those living there come off the DLR with their shopping bags full, walk across the square and disappear into the Arsenal? They don’t spend in Woolwich. Now there are plans for more housing in Warren lane – 3000 or so residences. Part of the plan as I understand it is for shops. I can see this becoming an alternative High Street for those that can afford it and possibly another nail in the doffing for the main High Street. But of course, there won’t be a betting shop there to compliment the 5, 6 or 7 in Woolwich as well as the 2 gaming arcades. It used to be that Woolwich was the place to come for shoes. Now its gambling and phone repairs. Meanwhile, the Town Hall has a leaking down pipe, damaging the brickwork, the “new” super duper pedestrian crossings in the town are sinking and the tarmaced hole by the pub, where the police car was set alight during the riots is still there. @Roy and Larry – yes the needs of the poor and social housing tenants need to be taken into consideration but the fact is that the social housing in the borough is on the whole extremely run down and neglected. How would you tackle this? How could the council possibly afford to regenerate these areas without private developers? Not spending £65M on a brand new council office in Woolwich (which will take 20yrs to pay for itself in terms of cost saving) as well as a £6M on a poorly designed square (where the reinforced concrete means that any gas/water/electrical problems necessitate major work that is rarely reconstituted properly) may be a start in terms of finding money. I am not opposed to redevelopment. I am however opposed to developers (and shareholders) profiting at the expense of local residents if social housing is being sneakily diminished. I don’t share the councils vision for Woolwich. I think they have missed many opportunities and acted in a self serving manner.